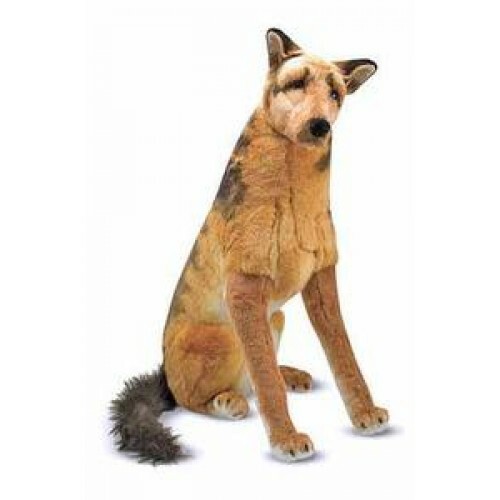 With its cocked head, this friendly German shepherd by Melissa & Doug is ready to hear from you! Gentle and well behaved, this beautifully constructed doggy is made of soft, furry fabric with attention to every detail. Bring home a friend to adore, or make an impressive statement in your bedroom. These soft, cuddly, premium quality plush animals have beautiful features. Cute expressions and are incredibly priced. The soft, lovable textures and remarkable prices make these animals friends perfect for play or display. These plush pets make extra special friends! Our big, cuddly canines make loyal playmates with strong, posable frames that keep them alert and strong dog-years.